News — Introducing the Pretzel Chicken Bake! Introducing the latest product from Auntie Anne’s – Pretzel Chicken Bake! This is a brand new concept for us, a slice of delicious pretzel topped with fresh chicken and cheese. Then you can personalise your bake by choosing a flavour sauce – BBQ, Sweet Chilli or Firecracker. Like all of our products, the bakes are made from scratch, our dough is mixed on site, hand-rolled and baked. Every product comes with a freshness guarantee which ensures the product has been baked within the last 30 minutes or less. 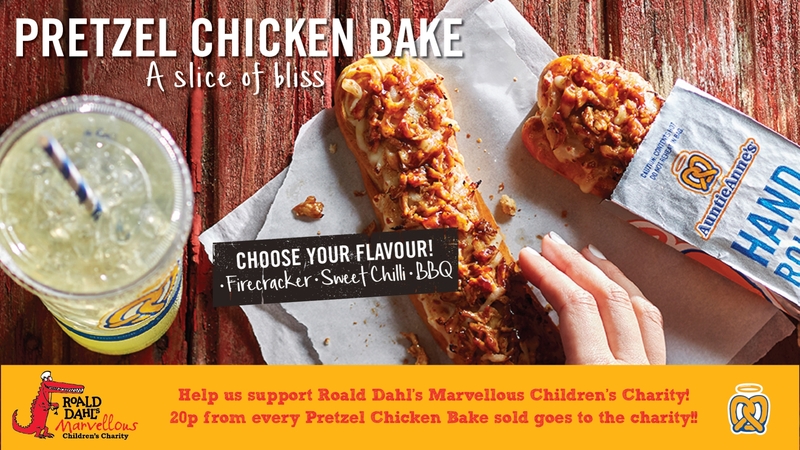 With every Pretzel Chicken Bake sold, we will be donating 20p to our new charity partner – Roald Dahl’s Marvellous Children’s Charity! The Pretzel Chicken Bakes will launch in the UK and Ireland on September 3rd 2018 and will be available until November 4th 2018. Now is your chance to get a slice of bliss, don’t miss out!